The California Science Center in Los Angeles is assembling the ultimate space craft collection — the museum is halfway to acquiring all four pieces of the launch outfit for the space shuttle Endeavor. The shuttle and the iconic orange fuel tank are already there, and the two booster rockets are on their way. 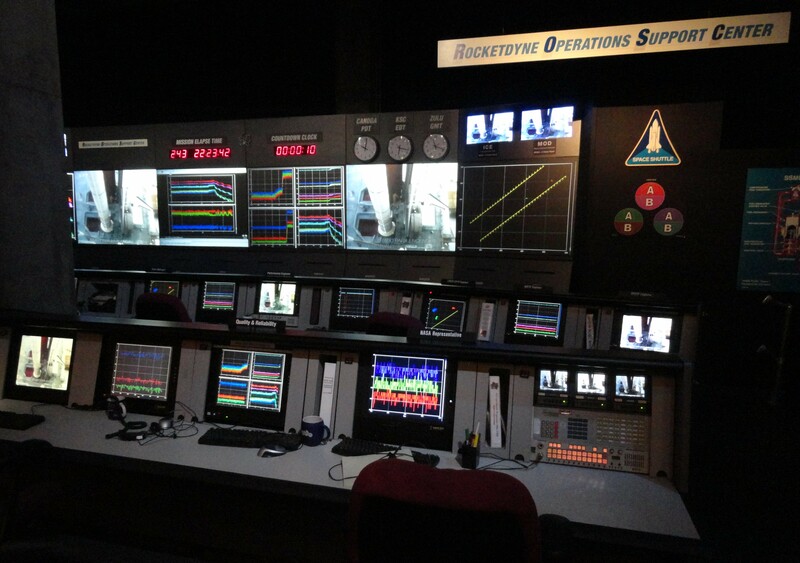 Walking into the center’s Endeavor exhibit, you are greeted by a variety of artifacts from the shuttle program, including landing gear, mission patches, the training toilet and a real control center. But when you look at the three clocks sitting above the mission screens, you might notice one that seems out of place. “Zulu” is often used in military and aviation for the time at the Prime Meridian, and KSC is Kennedy Space Center. But what — or rather, where — is Canoga? Unknown to most people, the aerospace company Rocketdyne had a host of design, production and testing facilities in Canoga Park, a residential suburb in the San Fernando Valley of Los Angeles, and my home. This is where the private aerospace company built the shuttles’ main engines and, from its support center, where Rocketdyne personnel kept tabs on the booster rockets during the first eight and a half minutes of all 135 space shuttle launches. For decades, Rocketdyne was hard at work building rockets in its extensive facilities at several locations in the San Fernando Valley. Canoga Park became a powerhouse in powerhouse production throughout the 1950s, 1960s and 1970s as Jupiter, E-1, J-2, Atlas and other rocket engines were developed in this sleepy corner of southern California. During development, Rocketdyne would send its engines from its facilities on the valley floor to its top secret Santa Susana Field Laboratory in the nearby hills for testing. The lab was even the proving ground for the iconic F-1 rocket engines that lifted the Saturn V and took astronauts to the moon. The field lab was also known for its long history of nuclear experiments, not all of which went smoothly. Later on, Rocketdyne kept busy producing and refurbishing engines for the space shuttle, developing the power system for the soon-to be-assembled International Space Station, and working on small defense projects, says Paula Korn, who was a member of the site communications team in the late 1990s. But these efforts gradually began to fade out or move to other facilities. A number of factors have led to the decline of aerospace activity in the San Fernando Valley. The barrier for aerospace research has fallen markedly as technology has become smaller and more efficient, creating more competition and allowing entrepreneurs, like Elon Musk and Jeff Bezos, to carve out a growing sector for their young firms. Smaller, lighter satellites are now routinely built and launched by a variety of companies around the world. What’s more, Korn says that politics have drawn activity toward NASA hubs in states like Alabama and Florida, where elected officials have catered to the industry. For decades one of the massive F-1 engines stood in the parking lot of one of Rocketyne’s facilities, smack in the middle of strip-malls and shopping centers. When I was younger, I would pass it every Saturday on my way to karate. 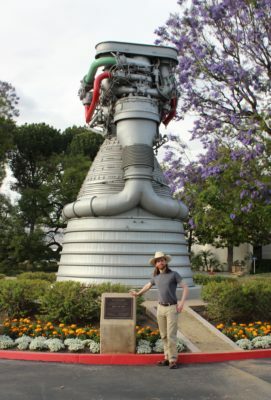 This facility has recently been torn down, but the rocket engine was moved only four miles away, where it sits proudly in front of another of Rocketdyne’s (now called Aerojet Rocketdyne’s) facilities. Last time I was home, I went to visit the engine. I drove past the old, torn down compound on my way to reunite with the familiar childhood landmark. During that trip I tracked down and visited nearly every site that had been involved in the aerospace industry. The experience allowed me to reflect on my neighborhood’s glorious history and watch as it slowly fades away, like an echo in the hills. The Roar of Rockets in the Hills is a valuable addition to the ‘space lore’ that is an integral part of California, and particularly Southern California, the home of Caltech’s JPL. I learned wonderful, intricate, details that I don’t think are available anywhere else. This long-time aerospace junkie and writer thanks you for the education.